Lock in a great price for Aleida's Hostal - rated 9.4 by recent guests. Aleida's hostal has a really nice location in a safe area near lots of restaurants and is on a quiet street away from the bustle of Quito. The rooms are all clean with comfy beds and good wifi. It is a family run little hotel with the nicest owner, Elena. She did everything in her power to make out stay great including letting us store our extra bags with her for free when we went to Banos and giving us big hugs on our return! Elena was a lovely host. Having had difficulty with our taxi driver, we called her and she helped direct him and even came and met us at the drop off point. The area has lots of great restaurants nearby - Korean and Mexican were a particular favourite of ours. Breakfast was good and even though my Spanish isn’t fluent we were able to effectively communicate with Elena. Excellent breakfast, better than most other places I stayed.. The neighbourhood is very safe and easy to get around from. Elena know everything and is very helpful in sight seeing ideas. Aleida is a great host! Clean rooms, great breakfast & comfortable beds. This was the second time we stayed here. Everything, the lady, the area, the breakfast, the place. We had such a great stay here so much so we will rebook when we return to Quito in two weeks. Located in a very safe suburb - close to all types of eateries, supermarkets - the bed was sooo comfortable, fantastic shower (with great pressure) & very clean. Great breakfast & wifi. Aleida went out of her way to make us feel welcome - if you want a good nights sleep, stay here! Elena was extremly nice and helpful. We could stare our bags, book an additional night spontaneously etc. There are lots of restaurants around, nice area. Very nice building, lots of wood. Excellent hotel in a great barrio in Quito. The duena, Elena, is very kind and attentive, and the other staff are also very helpful. Quiet, clean and comfortable room. Excellent shower. Great breakfast! Highly recommended. Elena is the best host ever! She's so kind, respectful and approachable. I really felt the place like home, even with my own keys! The neighboorhood has a lot of great restaurants and cafes, and I was really close to my office. The owner was super helpful, even though we don’t speak much Spanish she managed to communicate everything to us, arranged taxis and let us leave our bags while we went to Mindo for 2 nights. Breakfast was good and great location, many restaurants in the local area. Located 550 yards from the metro station, Aleida's Hostal offers free Wi-Fi and breakfast in Quito. There is a fully equipped common kitchen. An on-site restaurant and garden are featured. The rooms in Aleida's Hostal feature either private or shared bathroom facilities. Aleida's Hostal is 19.3 miles from the Mitad del Mundo monument and 550 yards from Foch square. Mariscal Sucre Airport is 9.9 miles away. Free private parking is possible upon reservation. This property also has one of the best-rated locations in Quito! Guests are happier about it compared to other properties in the area. This property is also rated for the best value in Quito! Guests are getting more for their money when compared to other properties in this city. Aleida's Hostal has been welcoming Booking.com guests since 24 Jan 2013. When would you like to stay at Aleida's Hostal? Features, private bathroom with shower and scenic views. This room features a private bathroom with shower and scenic views. House rules Aleida's Hostal takes special requests - add in the next step! Aleida&#39;s Hostal accepts these cards and reserves the right to temporarily hold an amount prior to arrival. Aleida's Hostal accepts these cards and reserves the right to temporarily hold an amount prior to arrival. One of the most picturesque neighbourhoods in Quito! Great clean hotel with everything you need. Good breakfast and friendly staff. Nothing. Would certainly stay here again. Good safe, quiet location in la floresta with lots of restaurant options in the area. The hostal is very clean and you will be served a hearty breakfast with different fruits each day. Aleida is a kind woman whose main concern is your comfort. She awoke at 4 am to make sure we got the taxi to the airport. Aleida’s hostal is beautiful, we loved the vibe. But what sets this place apart from other places that we stayed at is the owner: Elena. She is just too sweet! We loved to stay with her. Located in a great safe neighborhood with a lot of dining options. Elena who runs the property is the gem of this property! She makes sure your stay is perfect. She was up at 5:30 on our departure day to make sure our taxi arrived on time and gave us big hugs on the way out. We would definitely stay here again. Elena is an exceptional hostess. It was very close to all the good restaurants and easy access to public transportation. 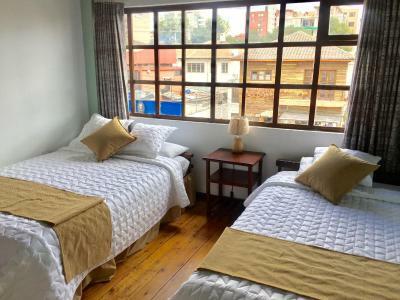 The hostel is located in a very safe access of Quito. Small things: An additional night was charged at a higher rate, laundry was quite expensive and the breakfast was not that varied. Pillows could be softer and slightly thinner. It's only my perception though. I prefer low pillows. Dont expect too much. The place is good to sleep, good breakfast, good location, good price. Great attention, breakfast changed a little bit day by day. Location is awesome, super close to all kinds of restaurants, all the way from affordable to top cuisine places nearby. Uber and such are extremely cheap, I'd say the cheapest in all cities I've been, so moving long distances is not a problem, at all.